Chuggington follows the humorous adventures of young Trainees - Wilson, Brewster and Koko - as they learn to ride the rails. Featuring a host of railway friends who help and support the trainees as they sharpen their social, emotional and personal skills, Chuggington offers unlimited adventure, learning and laughter. Chuggington Wooden Railway combines the classic charm of wooden train play with the exciting world of Chuggington. Featuring a wide range of collectible wooden engines, unique "2-in-1" buildings and compatibility with other wooden train systems, your child can recreate the fun adventures, enjoying hours of imaginative, developmental play. Chuggington has become a fast favorite in our home, so naturally the kids were more than excited to check out the all new Chuggington Wooden Railway: Over & Under Starter Set. 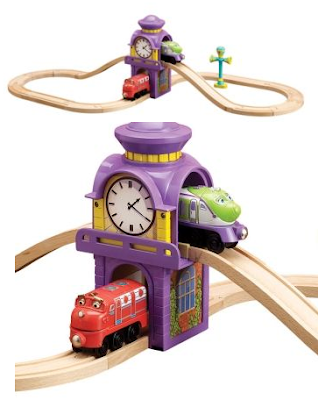 The Set comes with both Wilson & Koko Trains, the wooden tracks and Clock Tower / Tunnel (Pictured Above Top). The kids love to put the track together in various different patterns and B was thrilled that the wooden track was compatible with our other wooden train sets and train cars! The kids are excited to expand their wooden railway in the near future with the Trainee Roundhouse (Pictured Above). 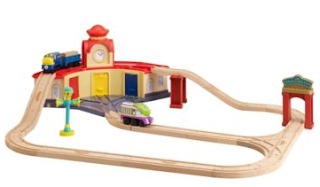 The All New Chuggington Wooden Railway offers hours of imaginative play, and with it's sturdy wooden construction it will last for generations to come. All Aboard! One Lucky Reader will receive a Chuggington Wooden Railway: Over & Under Starter Set. Leave a comment~ Which Chuggington Character is your litle ones favorite? The Comment is considered your entry. Entry to this giveaway ends at 12pm PST April 13, 2011. Winner's are chosen randomly through random.org. Winner's may not have won a previous Enjoy Lighting Giveaway. The winner will be announced in a post within 7 days of the giveaway ending, and contacted through email. The winner will have 48 hrs. to respond or another winner will be chosen. We LOVE chuggington just got some stuff for her 1st bday and she went CRAZY! We love KOKO and Wilson! I like Chuggington on FB. We follow Chuggington on Twitter. Also entered the Enjoy Lighting giveaway. My son's favorite trainee is Dunbar! My daughter's favorite trainee is Calley! hope I'm doing this right!! We weren't familiar with Chuggington so dont have a favorite. This set looks super cute though! My daughter's fav is Koko! What a great giveaway! This would be SOO awesome for Easter!